Slow fencing with no protective gear is one of the most useful activities in my current HEMA training. With slow fencing, I am developing control, awareness and self-regulation. This article explains some of the benefits I have gained from slow fencing, and outlines how to deal with some of its challenges. Devon advocates finding a speed to work at in which responses, rather than reactions, become possible. As well as permitting us to choose more considered and martially sound techniques, slow sparring can expose bad habits and gaps in our understanding of techniques. In The Buffalo Trap, Shanee Nishry describes how we can consciously or unconsciously try to compensate for weaknesses in technique by applying more physical force. At speed, we may get away with this, especially at beginner and intermediate levels; or we may simply feel that our techniques are not working, without understanding that we’re substituting force for skill. I strike at my opponent’s left temple, and she parries. If we form a strong-on-strong bind, I know that in this situation it is possible for me to strike her behind her sword by pulling my pommel under my right forearm, capturing the strong of her blade in my crossguard, and striking her opposite temple with my true edge. Students of the Liechtenauer tradition will recognize this technique as “duplieren”, or “doubling”. As I try to execute this technique, something goes wrong. Perhaps I fail to extend my hands sufficiently, creating a bind in the middle or weak of her sword instead of the strong. Perhaps my footwork is incorrect and I am too far away. Maybe my opponent’s parry is too wide to make the technique applicable. Any number of things could happen to cause my duplieren to fail. However, the speed at which I’m working and the force of my blow mean that I can’t identify any of these details. Instead, as I feel that my duplieren is going to fail, I’m likely to just push harder, struggling to apply enough strength to “force” the technique through. Anyone can fall into the buffalo trap – not just large or aggressive fencers. I have done so many times, but fewer since I started emphasising slow fencing in my training. Slow fencing allows me to examine my techniques as they play out, and pay attention to feeling and finer details. It forces me to use correct mechanics to make a technique work, as simply applying more force is too dangerous and unpredictable. Another exploration of the benefits of slow sparring can be found in Johnny Nguyen’s article on expertboxing.com: The Secret Fight Training Method – SLOW SPARRING. Much of the time, this is exactly how I feel when fencing! Slowing down helps me to process and think, rather than simply reacting on instinct. Likewise, when working at a slower pace, as a fencer I can observe and try to understand an attack as it develops. Where does my opponent’s blade start? What trajectory does it take, and does that change as I respond? Does my opponent move through recognizable guards or positions with her blade? What is the earliest visual indicator of an attack? Do my opponents feet, hips or shoulders move before she strikes? What does she do with her head? Her hands? Her eyes? I can also work to understand the consequences of my tactical choices. If I wind to ox here, what can my opponent do? If I close this line, where do I become open? Slow sparring without protective gear also means that we are forced to control our strikes. If we land a touch, it must be light enough not to cause injury. Recently, I feel safer sparring without gear than with gear – as many fencers seem to think that a mask and jacket make us invincible, and fence accordingly. With no protective equipment, rather than simply letting my sword fall uncontrolled towards my opponent’s head or body, I must always be in control of it and aware of how much momentum I allow in my techniques. The experience of finding a fencing speed at which you can control your strikes to avoid harming your training partner is excellent for training martial control. There are problems in slow sparring which I’ll readily acknowledge. The first is the challenge of maintaining martial intent and preventing your sparring from devolving into a game of “feder tag”, in which participants change their objective from making slow, genuine attacks to trying to “tap” or “tag” their opponent lightly with the tip of the blade. Another challenge is in managing the impulse to speed up in order to make a successful touch or parry. I will describe how I deal with both of these challenges, and how the process of working through them can be beneficial, rather than a reason not to do slow sparring. In slow sparring, as in technique drilling, we need to make sure we are making genuine attacks, at the correct distance, that present a proper threat. This is a challenge that we can rise to. With enough skill it is perfectly possible to maintain martial intent, with no gear, at any speed, without harming your opponent. For an illustration of this, watch this video in which Roger Norling demonstrates a brutal technique from Meyer’s quarterstaff on Ted Elsner of Sacramento Freifechter, who is wearing only light gloves. Any doubt as to Roger’s martial intent should be dispelled by the look on Ted’s face. However the nature of sparring at slow speeds and without gear does change the way I fence, and this can lead to a lack of realism in fencing situations. My opponent slowly extends her sword in a strike at my left temple. I countercut at the same speed, and we bind strong-on-strong. My opponent applies pressure and I resist it. We are in the perfect setup for her to perform a duplieren, but it would be far too dangerous for her to do so. The action of pulling the pommel under the forearm when I am resisting in the bind provides so much leverage that the strike would injure me; so my opponent doesn’t try it. We remain in a static bind for a moment. Inadvertently, I am training a false sense of security that remaining in a static bind is safe, when in fact I am providing my opponent with the perfect stimulus for a duplieren. Fencing without gear requires me to sharpen my observation, tactical understanding and awareness in the fight. Some openings become impossible to take because of safety, and without the feedback of my opponent’s blade connecting with my mask or hand, I may not realize that my head or hands were open targets. In this context, I rely on my training partner to give me that feedback verbally. We can pause as she explains that she had a direct line to my head and try to recreate the situation to allow me to choose a better technique. I’m fortunate to have an excellent training partner with whom I can analyze these kinds of situations, recreate them and work out drills to deal with them. Slow sparring helps me to practice awareness, and the ability to acknowledge to myself and my training partner when I have placed myself (or been manoeuvred into) a compromised position. I find this incredibly valuable. Another problem in slow sparring is ensuring that both fencers maintain a consistent speed and intensity. This isn’t just a problem in slow fencing, but slow fencing does make it more obvious. Competitive drive can lead us to break from our agreed or initial speed in an attempt to make a parry or land a touch. I am standing in long point, and my opponent aims a strike at my hands. I lower my hands to avoid her strike, exposing my head. As she sees my head become open, she changes the trajectory of her strike to aim at my head. As I was not expecting this, I must speed up suddenly if I want to parry. I may also twist my body and become unbalanced as I try to avoid her strike. In Devon Boorman’s terminology, my actions in the example above are a reaction rather than a response – the opposite of what I want to train. I need to avoid training myself to make reactions. The better course of action would be to acknowledge that my opponent had successfully opened my head for a strike and that, if we were working at speed, she would almost certainly have landed it. However, it’s not really important whether she would have “won” that touch or not. Rather, it is important for me to understand how my head became open, and how to fence better from long point with the awareness that A) my hands are a target and B) a strike can be used to draw my guard down, exposing another target. It’s also important for my partner to know when her technique was successful – so I should acknowledge when this is the case. Again, we rely on communication and acknowledging our own errors to learn these things. Many people see slow work as problematic because people can speed up to “beat” each other, resulting in a cycle of escalated intensity. But like all aspects of a martial art, learning how to maintain a consistent speed and becoming aware of when you are deviating from it takes practice. This is another way in which slow fencing helps build awareness and self-regulation. I find that slow fencing is one of the most useful and fun parts of my current training routine. With a controlled training partner and mutual respect for safety, we can experiment, make mistakes, and try out random ideas. 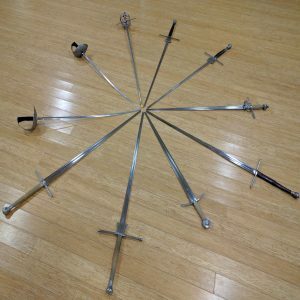 We can fence all day without getting fatigued, which means we can do swords more often and for longer. And we can make valuable insights into our technique, martial control, and awareness in the fight.